As recently as 1908 an object from space impacted our world. 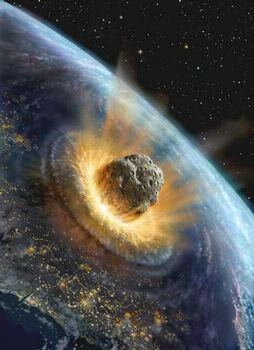 It exploded over Russian Siberia, coming ominously close to striking the Earth. Even exploding in the air as it did, it flattened 1,200 square miles of forest, with huge old-growth trees — 60 million of them — broken off instantly like matchsticks. Near the center, trees and animals were vaporized or instantly incinerated. This event, called the Tunguska Event, is believed to have been caused by very small asteroid, thought to be a mere 60 yards across. It exploded three to four miles in the air. The asteroid’s impact with the Earth’s atmosphere alone created a superheated wind that destroyed everything in its path. Imagine if the asteroid had been 60 miles across instead of 60 yards: three million times the mass of the Tunguska asteroid. Imagine if it had been made of slightly more durable material and had actually struck the Earth. But we really don’t need to imagine these or even more extreme scenarios. They have actually happened, as recent scientific studies have shown in frightening detail. It’s only in the last ten years or so that scientists have known that a massive Earth impact from space, probably an asteroid, occurred 65 million years ago, causing the extinction of the dinosaurs and the rise of mammals, which eventually led to human life. Scientists have discovered a huge crater in Mexico which confirms what was once only a tenuous theory. And to clinch it they’ve found heavy concentrations of iridium — an asteroid “signature” — in soil layers dated to that time at sites all over the globe, exactly what one would expect from such a huge blast, which would result in a world-circling cloud of ejected material that would persist for many years, changing the climate to a years-long winter and forever changing the course of life on this planet. The Chicxulub crater, as it is called, in the Yucatan peninsula was caused by an asteroid estimated to have been 6 miles across. And just a few days ago, it was announced that a much larger crater has been discovered in Wilkes Land in Antarctica — a crater some 300 miles across, the size of Ohio — which evidently was responsible for an earlier die-off, the Permian-Triassic extinction of 251 million years ago, when almost all animal life on Earth was wiped out, the greatest mass extinction in history. The object which made the Wilkes Land crater is believed to have been some 30 miles across. There are some 500,000 asteroids with diameters in excess of 1 kilometer — and they are constantly colliding with one another and being sent off into erratic orbits. According to the B612 Foundation, a group of researchers and scientists which includes former astronaut Russell Schweickart as its chairman, Earth is swimming in a virtual “swarm” of Near-Earth Objects (NEOs), any one of which could trigger devastation to Earth in the event of an impact. The goal of the foundation is to develop the means to deflect asteroids into new, non-collision courses. Now I am not trying to be sensationalistic here and convince you that a major impact will happen tomorrow. No one knows when the next such disaster will strike, and no one knows what its size may be. But I am trying to make an important point. And Earth impacts are just one threat. There are many other scenarios which would potentially leave the Earth unlivable. Shouldn’t we have a backup plan for that possibility, so our genes will survive even if Earth does not? Interstellar space travel may one day be our only option. Only the intelligence that brought us understanding of our place in the universe can save us when zero hour comes — and I am not just talking about impacts from space. Pandemics, nanotechnology warfare launched by an enemy, climate change and other environmental disasters, and a thousand other potential threats loom in the unknown future. Only the intelligence that brought us Western science can even detect the presence of such threats before it is too late, to say nothing of fighting them. Only the creativity that characterizes Western man can come up with solutions to the kinds of disasters that would forever wipe out lesser creatures. But the intelligence and creativity that characterize Western man are themselves under threat. The superstition, promoted by Jewish supremacists, of “racial equality” is leading the nations of the West to literally exterminate themselves through population replacement of their founding race with the teeming masses of the Third World, whose response to a cosmic threat would be a shrug of the shoulders while they concentrate on debauchery, fornication, and mindless violence below the animal level — or who would attribute the disaster to “evil spirits” and attempt to mitigate it with Voodoo chants or Santeria sacrifices for the brief remainder of their miserable lives. And the peoples of the West themselves, with failing educational institutions and with religions under the thumb of Jewish supremacists and Jewish myths, are increasingly losing their grip on scientific knowledge and on reality itself, as they descend to an understanding the world thousands of years behind the times. Increasingly, instead of seeing the world as it is seen by the best minds of our civilization, our people see it through the lens of a school system that fails to teach them how to find France and Russia on a map, but does teach them about the roots of “hip-hop” and “White racism” — or through the lens of the writings of primitive and wildly ethnocentric non-White desert nomads whose knowledge of the universe was essentially zero. So we’re dumbing ourselves down with a dysfunctional school system and superstitions which militate against rational thought. And we’re dumbing ourselves down biologically, too, through some of the most tragic results of these superstitions: open borders and racial mixing. We import and mix with tens of millions of Mestizos from Central America with an average IQ of around 80 and almost no geniuses — and we import and mix with Africans with average IQs in the 60s and 70s, the retarded range by our standards, and almost no people who are even moderately bright. And so much of our national wealth and energy and effort is soaked up by dealing with the horrible social costs of having these primitives among us — wasted wealth and energy and effort that one day may make the difference between life and death for us. Look at how we are allocating our resources. The B612 Foundation gets no government money. The biggest spender on the study of potential Earth impact objects is NASA — and they spend only 4 million dollars on it in a year: less than one fiftieth of the amount spent on the Iraq War in a single day. The total number of people monitoring Near Earth Objects (most of them amateurs), is, according to Astronomer David Morrison of NASA’s Ames Research Center, equivalent to one or two shifts of employees in a single McDonald’s restaurant. Compare this with the huge and growing infrastructure devoted to making sure that our rapidly-multiplying underclass is housed and fed and entertained. Compare it with the huge amount of national wealth — and the very lives of intelligent, creative White men and women — which are being thrown away every day securing the borders of conquered Iraq for Israel. As I said, I mention the subject of inevitable space-borne catastrophe as but a single example of the challenges we will face that will require the best minds that our race can produce for their solution. The next challenge may be different: a new virus ten times more tenacious and deadly than AIDS, a superhurricane that makes Katrina look like an April shower, a doomsday weapon developed by China or Israel that holds all civilization hostage, a sudden change in the Gulf Stream triggering catastrophic climate change with no comet or asteroid needed — who knows what may come? The issue which screams for our attention is not only are we going to be ready when disaster strikes? — but also what are we doing to ourselves? — how are we ourselves changing, and do those changes militate for our survival or against it when zero hour comes? When that hour comes, will we as a race and as a civilization stand poised with our best minds in control of an advanced technology able to literally change the fate of star systems — so that our genetic patterns will live on and advance forever, whatever the cosmic challenge? Or will we be mired in the genes of the jungle, ruled — despite the presence of a few high-IQ Whites — by the needs and desires of the primitives among us, and stand helpless holding our TV remotes, our fast food wrappers, our holy books, and our totem sticks — unable to do anything to alter the onrushing death of our world? The choice is ours, ladies and gentlemen. The choice is ours.